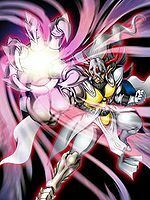 Although it was originally a high-ranking Angel Digimon that ruled over death, it despaired against the unreasonable justice of the world and rebelled against God. It then received the scourge of God and eternally lost one of its eyes and half of its body, and has since replaced that half with an artificial body cut from a sacred ash tree. Its long, artificial right arm can catch hold of ghostly forms, and rip the soul out of a living Digimon's body. 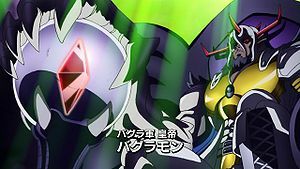 The extracted soul can be sent to heaven or hell as Bagramon pleases, and can even be placed in another Digimon's body, a Signature Move of Bagramon's named "Astral Snatcher". The large ruby that it replaced its lost eye with conceals its "Invisible Snake-eyes", a power that allows it to observe anywhere within the Digital World, and with this ability, Bagramon is able to instantly obtain any information it wants to know. Due to these, Bagramon is known across the Digital World as the "Sage of Death". Although Bagramon's sins will be forgiven if it repented before God, Bagramon will not go back to submission under God. This is because Bagramon still seeks to replace the "Unreasonable Justice of the World" that God constructed, and its goal in life is to banish God from the world with its "New Justice". 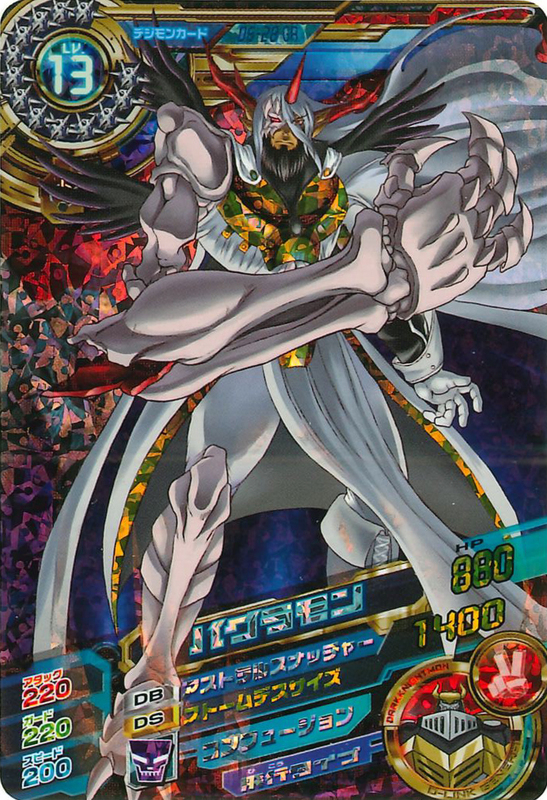 Although it was originally a high-ranking Angel Digimon that ruled over death, it despaired against the unreasonable justice of the world and rebelled against God. It then received the scourge of God and eternally lost one of its eyes and half of its body, and has since replaced that half with an artificial body cut from a sacred tree. Its right arm catches hold of ghostly forms, and rips the soul out of a living Digimon's body. 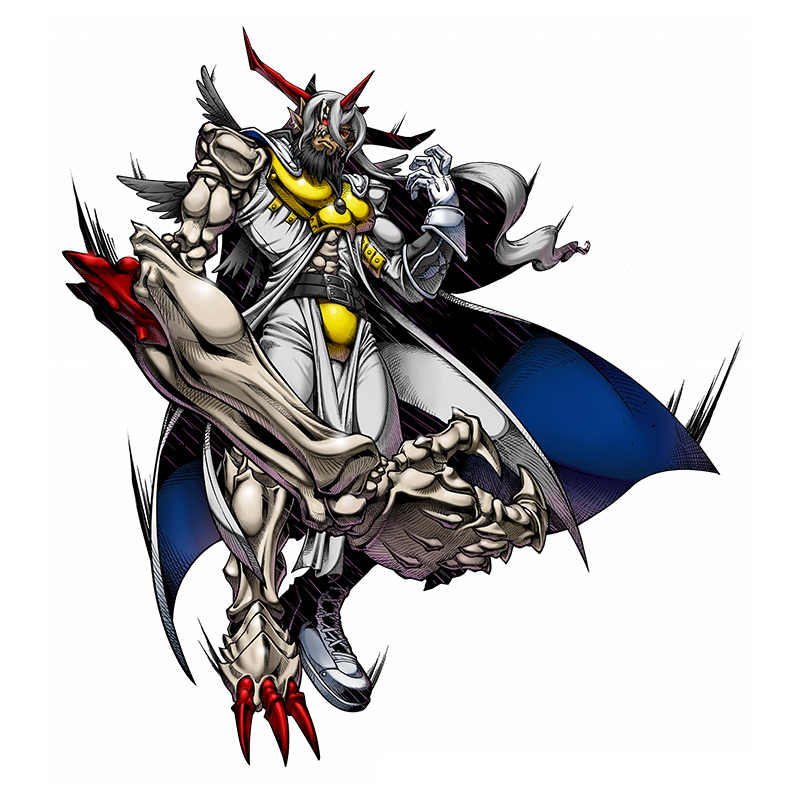 That soul can be sent to heaven or hell as Bagramon pleases, and can even be placed in another Digimon's body, referred to as "Astral Snatcher". The large ruby that it replaced its lost eye with conceals its "Invisible Snake-eyes", a power that allows it to observe anywhere within the Digital World. Due to these, Bagramon is known across the Digital World as the "Sage of Death". 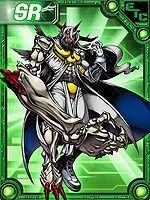 Although it was originally a high-ranking Angel Digimon that ruled over death, it despaired against the unreasonable justice of the world and rebelled against God. Its "Astral Snatcher" is a Signature Move which can send a soul, ripped out of a living Digimon's body, to heaven or hell, or even place it in another Digimon's body. The large ruby that it replaced its lost eyes with conceals its "Invisible Snake-eyes", a power that allows it to observe anywhere within the Digital World. Title: 「死を司る賢者」 — "Sage of Death"
Possible demonic inversion of Gabrael (גַּבְרִיאֵל‎), the "Angel of Revelation" in the Abrahamic religions, who was often entrusted to deliver several important messages on God’s behalf, and the responsible for announcing the Judgment Day. Also, "Bagura" is a play on Software "Bug" (「バグ」 Bagu). 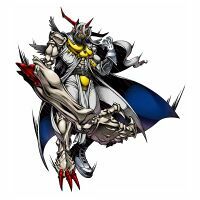 Rips a living Digimon's soul from its body with its right arm, and sends it to heaven or hell as it pleases, or even places it within another Digimon's body. Observes any location within the Digital world using its ruby-eye, allowing it to instantly obtain any information it wants to know. 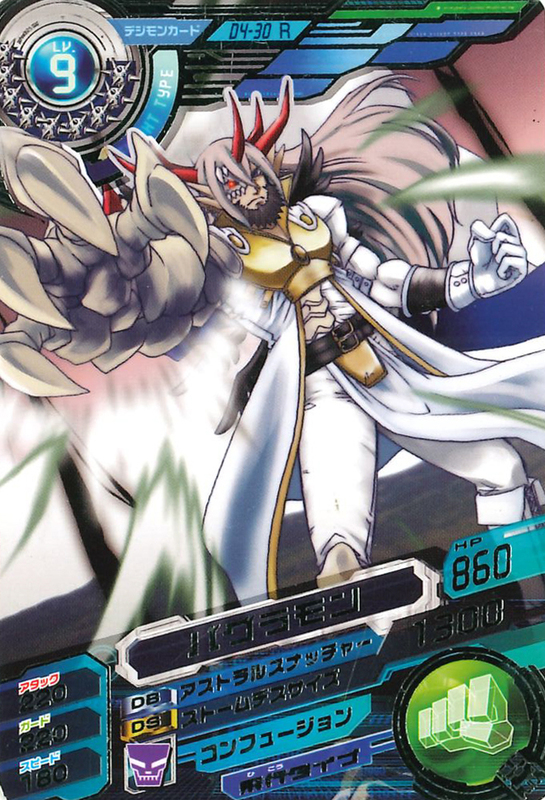 Choujigen Storm  Super-dimensional Storm 超次元ストーム Choujigen Sutōmu Savage Cyclone Generates a dimensional storm anywhere within the Digital World through which it stretches its right arm to attack the opponent. Bagramon is the ruler of the Bagra Empire. 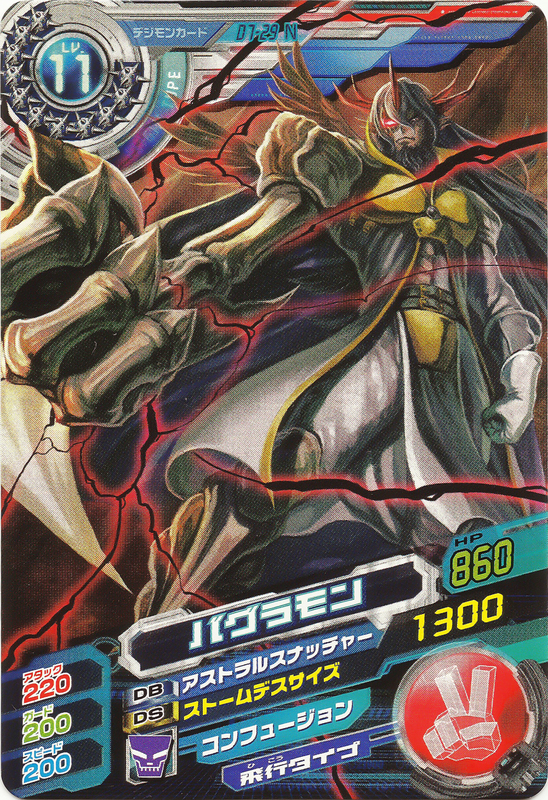 He aims to collect the Code Crown in order to take control over the Digital World and used the Death Generals as tools to transform the Code Crown into the Dark Stone in to initiate D5. 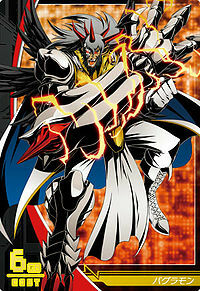 He is also revealed to be the older brother of Dark Knightmon. Resurrect! The Appearance of all Seven Death Generals!! Glorious DigiXros, Seize it! Our Future!! 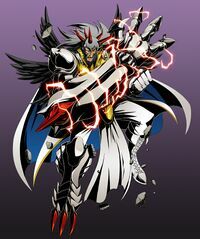 Bagramon's original angelic form as depicted in Digimon Xros Wars (Manga). Bagramon is the ruler of the Bagra Empire. 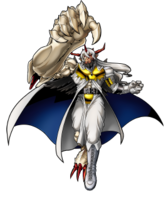 He was originally a high-ranking angel Digimon, but was banished after questioning Homeostasis about the existence of evil in the world and challenging God. He then used the remains of the server tree of Yggdrasill to create anew the right side of his body that was burned by God's lightning. He started the Bagra Army in order to destroy the world he thought was built wrong, and to give a merciful end to the humans whose hearts he saw as something fallen into despair with no chance of recovery. 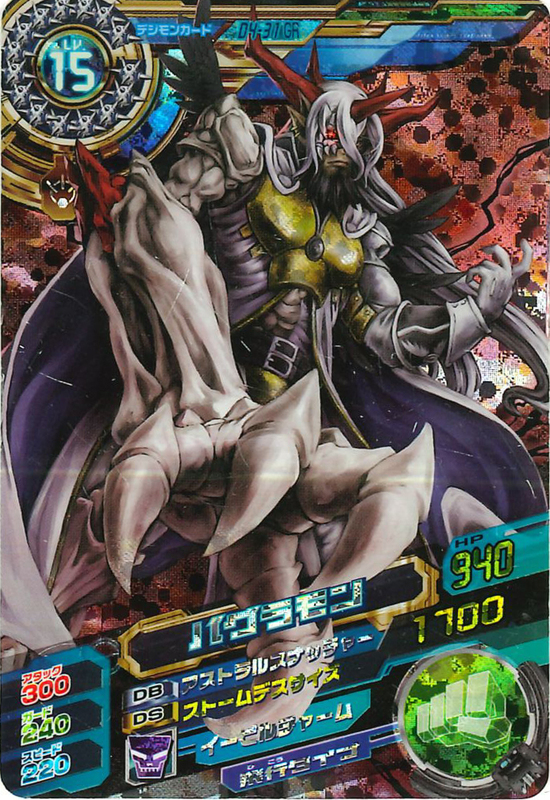 He was also the one who handed Shademon to Skull Knightmon to test his extent of despair. However, the human Generals and their Digimon partners managed to prove to him in the end that hope still exists within the human heart, and he used his last moments to make amends with his younger brother. Xros Dreams!! Dreams Can't be Broken!! Xros Stars! Like a Falling Star!! Xros Miracle!! Reel in a Sliver of Hope! Bagramon is only obtainable as a collectible DigiCard. Bagramon is an unobtainable Boss Digimon. A Digimon who schemes to turn the Digital World into a world of evil by gathering the Code Crowns from the various Zones. The ruby implanted in place of its lost right eye conceals the power to observe the entire Digital World. 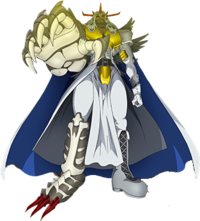 A Demon Lord Digimon that serves as the emperor of the Bagra Empire. 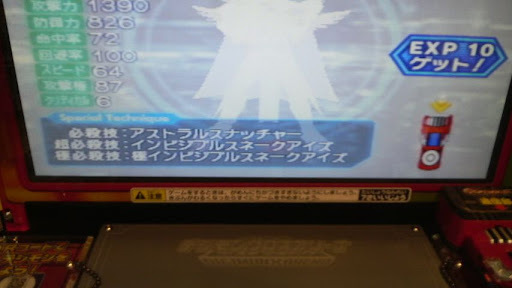 It was formerly an Angel Digimon that governed over death. It used a super-dimensional storm to blow Taiki and his friends to another space, and took control of the Digital World. Its power knows no limits. The Digimon that rules over the Bagra Empire, and plans to take over the Digital World. 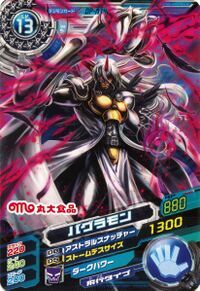 It is also the elder brother of Dark Knightmon. Its long, artificial right arm is capable of grasping spiritual matter, allowing it to retrieve just the soul out of a living Digimon's body. 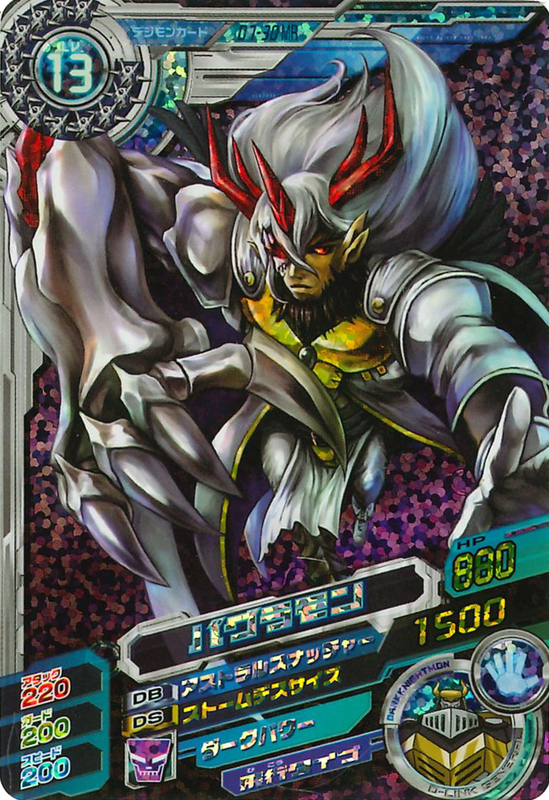 A Demon Lord Digimon with the alias 'Sage of Death'. It lost one of its eyes and half of its body for eternity as punishment for disobeying God. 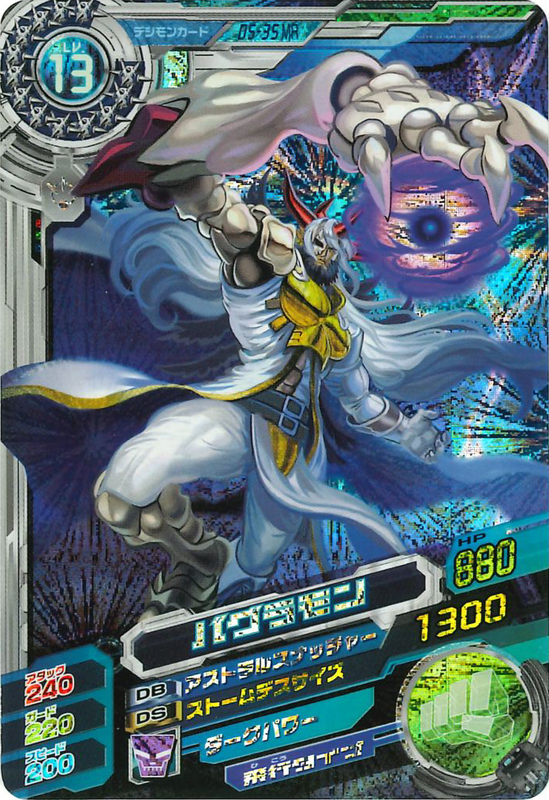 An Angel Digimon that originally governed over Death, it fell into despair with the order of the world and started a revolt against God, for which it was punished. Even now, it continues its search for a new world order, to take the place of the order set by God. ↑ Digimon Xros Wars: "Taiki and Kiriha VS the Bagra Army, A Complete Showdown!" ↑ Digimon Xros Wars: "Approach! The Human World's Last Day, D5!!" ↑ Super Digica Taisen: A newsflash just before the Sixth Act is in motion! The most evil DigiXros!? 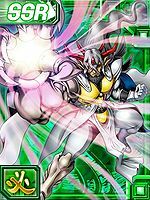 The advent of the "Demon Emperor" DarknessBagramon! 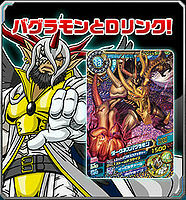 ↑ Bagramon's voice can be heard for the first time as the Bagra Army's Emperor in "Rival Kiriha, Appear!". This page was last modified on 1 April 2019, at 11:54.